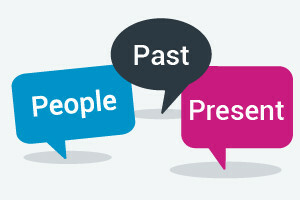 This free online English grammar course will teach you how to tell stories about the past and how to form the past simple tense of verbs in English. You will also study the different rules for regular and irregular verbs in English, how to form positive and negative English sentences, and the essential topics of English contractions, infinitive verbs, and conjunctions. This will bring you to the next level of your English studies. The course will first introduce you to English words and phrases regarding time, and will teach you how to properly write and pronounce years, months, and dates. You will learn that by adding 'd' and 'ed' to regular verbs, they will be changed to past simple tense. You also study how the verb 'be' is used differently in English past and present tenses. This course will also teach you the use of positive, negative, singular, and plural forms of verbs in English. You will then look at regular verbs, irregular verbs, infinitives, and contractions in English sentences. You will learn how to use contractions with negative forms such as "wasn't" for "was not" and "weren't" for "were not". You will also study why we use certain conjunctions in the past to express reasons and results, as well as why we use adverbs in English sentences to talk about states and habits. Finally, you will learn how to improve your English conversation skills. Verbs are absolutely essential in any language, so taking this course will give you English skills a real boost. By the end of this course, you will have practiced your conversational skills, English adverbs, and English question sentences, and will have learned two very important English tenses. Additionally, the audio exercises in this free online English course will really help you become familiar with the native English accent. So why wait? Continue your English learning journey, today. Illustrate how the verb 'be' is used differently in past and present tenses. Demonstrate the use of positive, negative, singular and plural forms by completing tasks. Show how we refer to different persons in question sentences. Give examples of sentences using different time words and phrases. Be able to pronounce years, months and dates properly in English. Use examples of regular verbs, irregular verbs, infinitives and contractions in sentences. Prove why we use certain conjunctions in the past to express reasons and results. Explain why we use adverbs in sentences to talk about states and habits. List things we can do to have better conversations with people.